The World Tarot Card brings a message of the arrival of your heart’s desire. Regardless of what it may be. These could include achievements, recognition, triumph and successes. This tarot card signals a time of holidays and travel, enjoyment and most importantly time with your loved ones. This tarot card signifies a fulfilling relationship is in your near future whether that be love, friendship or professional. A great message to treat yourself to the material things you’ve been longing for and procrastinating about. The World Tarot Card can also mark the end of one cycle in your life and the beginning of a different one. Think of one door closing and another opening. Negatively however, The World Tarot Card can point towards a delay in your life. It is very likely that you will still need to overcome those challenges before you succeed in the goals you have. This tarot card is a strong reminder to not give up, especially when you are so close to achieving the goal itself. Do not lose your vision or desire to achieve what you have set out to do. This is the predominant meaning behind this card appearing in your reading. In the tarot deck, the world tarot card is a Major Arcana card, a part of a suit of twenty two cards in the Tarot deck. These cards are known as permanent trump and suits in activities that involve the Tarot deck. The world tarot is usually the final card of the Major Arcana and it is usually worth five points. So, what does it look like? 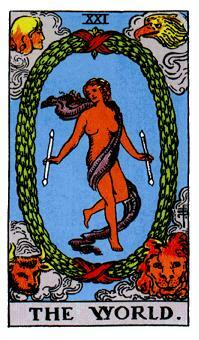 The world tarot card depicts a almost naked woman that is hovering above the Earth. She is holding a stick in each hand and usually she’s being observed by several creatures like lions, ox, eagles or others. This figure is presented as if she’s enjoying the end of a journey and at the same time celebrating an opportunity for new beginning. It is worth noticing also that a woman presented on the world tarot card has her legs crossed, the same as the hanged man. This means that she is some sort of his opposite because while the man looks infinitely inward, the woman is focused infinitely outward. Wands in her hands are explained as representatives of evolution and balance. Around the woman is a green wreath. This is a symbol of victory, success or achievement and this wreath is tied with red ribbon, which represents eternity. What is interesting is that the ribbon is tied in infinity knot, which is a symbol of limitless reward for those who put effort in improving both themselves and the ones close to them. Stars in the edges of the world tarot card are there to reward positive efforts made by someone and they indicate enlightenment and cosmic awareness. Each of the four corners of the world tarot card hosts one of the figures that are present on the Wheel of Fortune card as well. This reflects the cyclical progression of time and the four figures present a lion, bull, eagle and cherub, which are symbols of four fixed signs of zodiac – Leo, Taurus, Scorpio and Aquarius. Also, these represent the four elements, four suits of the Tarot, four sides of the world and four seasons. All of these are within reach of the woman dancer in the middle. When it comes to the planetary ruler, for this card it is Saturn, the symbol of time. The World is supposed to signify completion, achievement and fulfilment. This card shows that all the efforts are paying off and that one of your life cycles is coming to a successful end. If you come across The World Tarot card, it will mean you’ve been through difficult times in the past and all the challenges you’ve endured have made you stronger and more experienced when compared to the start of the journey. If you look from a point of relationships, studies or work, this card means that your relationship, career or perhaps a long-term project has come full cycle and now you are feeling as if you’ve completed a part of your life and you can move on without looking back on it. So, to be more concrete, it can represent a graduation, marriage, the birth of a child (in this case, the World Tarot card would represent the end of pregnancy) or realizing a long held dream. It means you’ve reached your goal and you can see the purpose of your being. Everything is in the right place, your life turned out the way you were hoping for it to turn. In essence, the World tarot card also represents a new beginning or the start of a natural new cycle once the previous ends. This card also has the purpose of encouraging you to look for a well-earned praise and to expect a celebration for what you’ve achieved. If no one decided to do this for you – organize it yourself because you’ve waited for a long time to achieve that goal and you certainly deserve it because your hard work has finally paid off. Also, be aware of the fact that this card can show itself even before you’ve reached your goal and it can work as a warning or stimulator for you to stay motivated and on the right track, so if you got the World Tarot card and you don’t know what it means, take some time to reflect on your life and find its meaning. Also, take time to analyze what you’ve been through in the past and you’ll most likely be very surprised with what you’ve done so far. The world tarot card can also be a symbol of a point in time where you can see the entire process or a period where you can make sense of your place within a certain system. This card is meant to teach you about your deeper understanding of your role and your impact within your community or certain environment where you truly fit. This card also shows a strong feeling of unity and wholeness with the world in a particular situation because everything is fitting in its place and you are in control of your life. Once you get this card, it will mean it is time for you to get more involved (or you already are) in your community or interests. You will have a strong wish to contribute to others and to give back to those you’ve helped you get where you are now. Since you are now in a good place full of love, knowledge and wisdom, you will certainly want to share it with others who haven’t yet acquired the same. If we want to go to more concrete explanations of the World Tarot card, it can indicate travelling the world, especially on a large scale. If you are fortunate enough, it can represent a long-term trip to some distant destinations or a working/studying opportunity overseas for six months or longer. Connected to this, the card warns you to develop and remember how to think universally and to be globally aware. Since you’ll most likely be travelling a lot, you’ll encounter new people, cultures and experiences which will become a part of your world. If the World tarot card appears reversed, it could suggest that you are striving for an achievement that is difficult to achieve and at the same time, you aren’t taking all the necessary steps and you aren’t putting enough effort in. It can mean that you are usually taking the easy way out and you aren’t committed enough to your cause which could ultimately lead to an outcome you aren’t expecting. Even so, it can have a positive impact on you because you’ll learn and grow with challenges you have to face and this will motivate you to change current course of actions and achieve what you wanted in the beginning. So does this mean you should settle for small goals? No, it doesn’t. It means you shouldn’t be afraid of stretching your goals even if it means you’ll face a lot of hardships along the way because the victory will taste even sweeter in the end. The reversed World Tarot card can also be a symbol of a point in your life where you are very close to achieving your goal, but for some reason you are losing focus and preventing it from becoming a reality. Now, since you have very little to go before you can celebrate, it is very important to motivate yourself and remember how wonderful it will be once you finally reach your goal. This can also mean you are facing a lack of closure in your life which is keeping you away from starting a new life cycle and thus you fell unmotivated and depressed. If we are talking about relationships, it can represent a relationship that has suddenly come to an end without an explanation from the other person. If you see the reversed World Tarot card in a reading, look around for what the other cards are telling you because you’ll likely find the answer in them and it will enable you to have proper closure and move on to a new life journey. Sometimes, the reverse World tarot card can indicate that even though you are wishing for a change to happen, you’ll have to wait for a certain period of time and you will have to devote more time and energy into action steps you have to take in order to achieve the desired change of completion. Since it is natural for people to be ambitious, this can be very frustrating but you have to stay strong and persevere because it will pay off eventually. Even if you feel stifled and trapped, don’t give up and keep on the same path for now and have faith that it will show results. This card can also indicate a need to bring your attention and energy from within yourself in order to help you master the spiritual lesson this card contains. If you need a method for ‘implementing’ this cards meaning, meditations with the Tarot cards can be very effective.